[Widget_Twitter id=”1″]The last month I have found myself drawn to everything red, white and blue. At first I shrugged it off as our nation’s birthday was fast approaching, and I was beginning to think about hosting our very first 4th of July party. It was an easy jump from thinking about party planning – to ‘needing’ to have the right decorations – to seeing everything red, white, and blue. I mean, I still hadn’t decided if we were going to host a party or not. Last summer, we sold our home of 17 years and moved to the lake house. 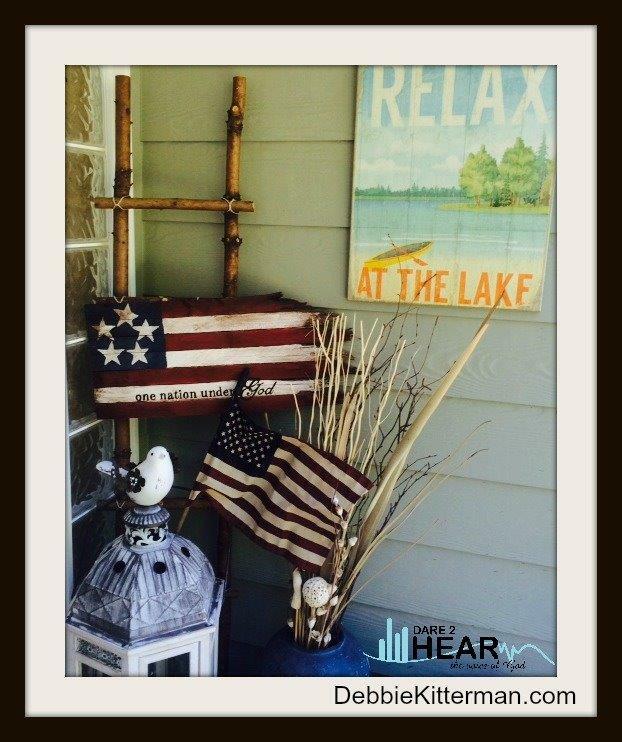 The lake house that our dear friends who moved clear across the country used to own and the place we have went for the last several years to celebrate the 4th of July. So, I kind of felt obligated to have a party – I mean, it’s expected right? Patti is fabulous, generous, and an extremely talented writer, decorator, DIY Crafter, furniture painter, hostess, and most importantly a Lover of Jesus! Oh, I could add more to the list of her accomplishments – You should hop on over to her blog and look around; in fact, you will see glimpses of my new home – her old home. You will not only be inspired by the beautiful things she creates, but by the inspirational things she writes – breathed straight from the heart of God. Why am I telling you this? 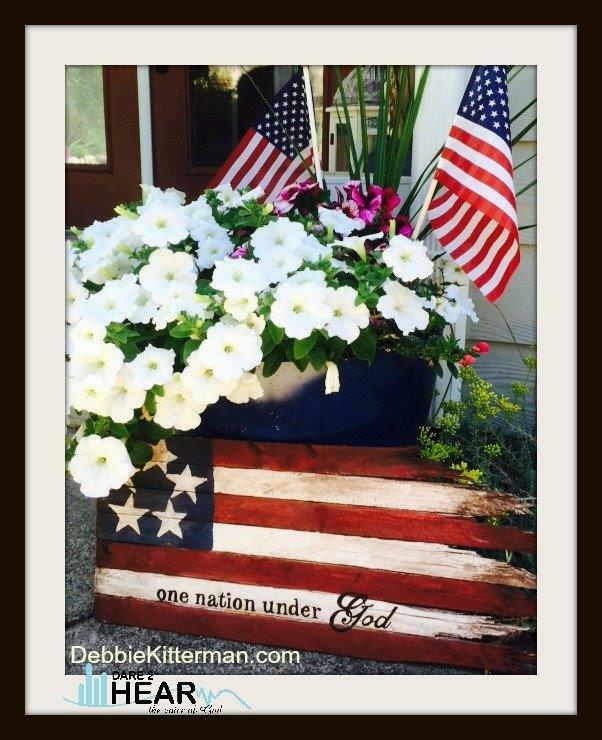 Well, I continued to be drawn to everything red, white, and blue, and I figured it must be because Patti took me to the Pottery Barn Outlet when I went to visit her in South Carolina last week, and I fell in love with the all their patriotic décor. I mean, if I was going to have a 4th of July party, then I need decorations too. 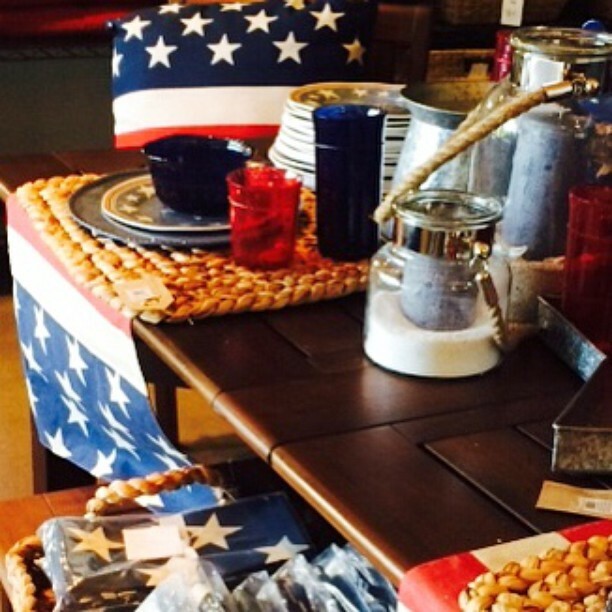 I was drawn to the flag pillow, the flag table runner, all the red, white and blue dishes, oh, the list goes on. Good thing I only had 1 suit case, and I didn’t have much room in it. Plus, I didn’t really need any of the items, but oh, they were pretty. Then, there was the shirt at Cracker Barrel that was flag inspired, that I kept being drawn too, even though I would never wear it. (No, I didn’t buy it, nor did I buy any of the red, white, and blue décor). After returning home, and back to reality, I was out running errands, and again, I was drawn to everything red, white, and blue. As I was asking God for a blog post this week and what I should write about, I kept being drawn back to everything red, white, and blue. I began to think about the elderly war hero I met in the store, and how I almost missed a God encounter. Not to worry, I won’t leave you hanging, check in next week, and I will share all about how I almost missed what God wanted to speak to me that day. I decided that maybe I should stop trying to figure it out on my own and just ask God if He was trying to get my attention in regards to everything red, white, and blue calling my name. Did He have something that He wanted to say? Was He trying to tell me something? I was pretty sure that it wasn’t about buying decorations to make my house look great for a party. Don’t take this wrong when I say it, but I have never before been drawn to red, white, and blue. I am patriotic! I am an American! I love my country, support my country and am grateful to the men and women who have served and fought and are currently serving so I can be an American living free in my country! Yet, owning anything red, white, or blue other than the American flag that I proudly display, is just not who I am. I had the sense that there was a deeper spiritual message to seeing everything red, white, and blue that I was missing. When I slowed down long enough to begin having a conversation with God, He confirmed I had only been looking at the natural things, but I was missing the deeper hidden message. He had been trying to get my attention for a few weeks, and I finally had an “ah-ha” moment. God had been trying to show me something for weeks and I almost missed it. I am in good company though, because the disciples often missed the message Jesus was sharing too. As Jesus was telling parables, He was revealing the secrets to the kingdom, and yet they didn’t perceive it. The parables Jesus told were simply word pictures, stories of things to which the people living in those days and times could relate. In Matthew 13, He told the parable of the sower and the seed. The people Jesus spoke to were farmers; that is how they made a living and provided for their families. His audience easily understood and drew parallels between what Jesus was saying and their own real-life experiences. There is a deeper spiritual message in Jesus’ parables that was overlooked by both Jesus’ original audience and some contemporary readers of the Word. What message was God trying to get my attention about? It is a simple yet profound message and totally symbolic of what red, white, and blue represent to our country, to you, to me. I just had to ask the question, “God are trying to say something to me about red, white, and blue”? He responded by simply sharing with me, what they stood for and their significance to our country. Red, White and Blue in America represents everything American. The colors represent the foundation of our country, the freedom which we fight to maintain. But more importantly, these three colors have represent our country from its birth, and God was the foundation and cornerstone of our nation at its inception. Yet, today, God is far from the center of our great nation. I keep hearing the words from the poem – We need God in American today by Carmen. About a month ago, I saw a YouTube video of a young girl, Karis Peters, reciting the poem that her dad had modified it slightly. It resonated in my spirit, and not because it was a stellar performance, but because of the words she was speaking. – We NEED God in America again today. Our country was founded on the principles of the Bible and when you take God out of the equation – try to remove Him from the foundation of our country, then we are left to our own ways, our own devices. We need to only read the pages of Scriptures to see what happened when they removed God from their lives, their foundation. It’s time church to rise up and stand up, repent – to cry out – God Bless America – We need You God in our Nation Today! As we approach our Nation’s Independence Day let us all ask God how He would have us pray for our Nation and if there is anything specific He wants to say. When I take the Spiritual significance of these three colors and apply them to our nation along with what they represent in the natural, it is powerful. God’s protection and anointing is on our nation because our founding fathers chose to put God first and freely accepted the Sacrifice that Jesus made. The very presence of God is in our nation because we chose communion with Him – “One Nation, Under God, indivisible” ….. Our founding fathers received revelation from the Holy Spirit and recognized communion with God was essential for our freedom, liberty, and pursuit of happiness. After all, Jesus came to set us free! We are made Holy and Righteous in the sight of God because of our relationship with Him. What does red, white, and blue mean to you? When you look at the spiritual significance of the colors what is God speaking to you? Like me, have you ever found yourself almost missing God speak? Be blessed today and I hope you were encouraged! Thanks for the shout out Debbie! You make me blush. TeeHee! I’m glad you got past all of the distractions and heard what God was saying to you. How easy it is to be distracted by every shiny thing calling my name. Thanks for the meanings of the colors red,white and blue at the end. I will be thinking on what they mean to me. BTW, it looks like you did do a little porch decorating and I love it. You are so welcome for the shout out and the meanings of the colors too! 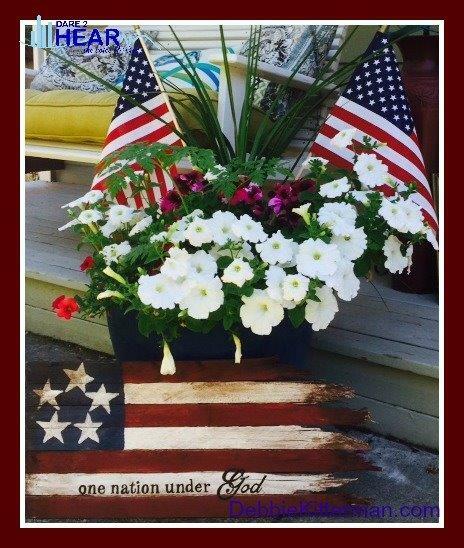 Yes, I did some porch decorating – most of it was done already from Spring – I just bought a few flags to put in my pots for the 4th and My God Bless America Wooden sign was purchased at a holiday bazaar last November. It has actually been hanging up outside since. I am loving my porch and enjoying decorating for the seasons. Wow Deb….this is well written, deep, moving. I needed to read this…it was written and shared at a great time for me. Thank you! Thank you Mindi! I am so glad it was just what you needed and just when you needed it too! Debbie, Good job, you go so deep, but make it understandable. Thank you for sharing, I know what God was saying to you applies to a lot of us. What a wonderful tribute to all the is good – God and country. I will never look at the colors red/white/blue the same way again. Thanks for sharing. Visiting from Counting my blessings. Yes, I can often become so “busy” that I miss those moments. It gets loud and fast and there’s always a dozen more things to do. I often wonder in the moments before I fall asleep what I may have missed that day because of the hurry. I’m grateful that God sometimes uses the simple and ordinary to show us more meaningful things, and that He doesn’t give up on us when we miss them. Yet another reason to praise Him. God has lessons everywhere we are and go. I do not want to miss even one, but I have missed hundreds (or more) but God has never let me go and will try again later. I am grateful for His ever present love and His desire to have me grow in Him. How our minds get caught on something that is not even where God intends to take us, but He knows how to get us back around. Amen. yes…it is so important to slow ourselves down enough to see and hear the divine. Nothing compares to God for sure. Thank you for sharing, neighbor! May God continue to bless you and keep you! Great words today! When I see red, white and blue I immediately think about the USA. However, I also see the great divide between loving our country and loving God. There is this huge separation that has occurred and we forget that we have the USA because God gave it to us. Thank you for the way you described the red, white and blue in terms of their spiritual meaning. Blessed to have you at The Weekend Brew. I really think that this is something that we all need to be mindful of- especially now when it seems that our country is so fragile. Kori- You are so right! I wrote this post a week or so before I posted it and it seems to be God’s perfect timing. Thank you for stopping by. Thanks for sharing at #RaRaLinkup today! Interesting to learn the meanings of the colors…and great encouragement to pray for our country! Angela – Thank you for stopping by and THANK YOU for the great post over at RaRa Link UP! Tai – Thank you so much for your visit today! It is good to have you stop by and you are most welcome. 🙂 You also have a wonderfully blessed 4th of July!